"How can I edit a scanned PDF document without Adobe Acrobat?" "Is it possible to edit scanned PDFs without converting the file?" If you have an image-based PDF file and want to edit it, you need a PDF editor with the OCR function. However, most PDF editor programs do not come with this feature. And Adobe Acrobat is quite expensive and complicated for the average user. 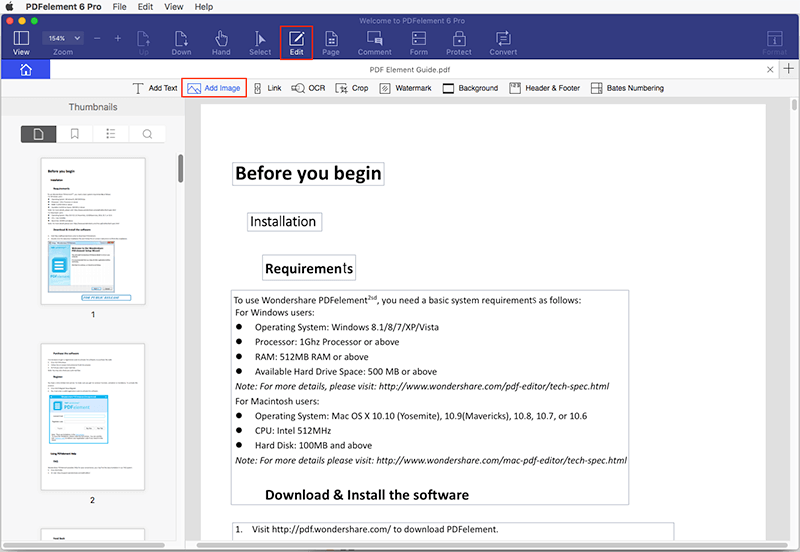 Luckily, we’ve decided to share the easiest and cheapest way to edit scanned PDFs with PDFelement ProPDFelement Pro on both Mac and Windows systems. One of the ways you can edit scanned PDFs on Mac (macOS Mojave), is to use a program like PDFelement Pro. This tool presents features that can be used to fully edit even scanned PDF documents. The reason you can use this program to edit a scanned PDF is because it has a fully functioning OCR feature. It can also be used to fully edit the PDF document once OCR has been performed. With this professional PDF editor, you can edit text and images within your document effortlessly. To begin, click "Open File" to open the scanned PDF in the program and import the scanned PDF files on Mac . You will get a notification showing that the file is a scanned PDF and that you should perform OCR. Go to the "Edit" menu and click on the "OCR" button. You can open the OCR panel on the right side of the program interface. 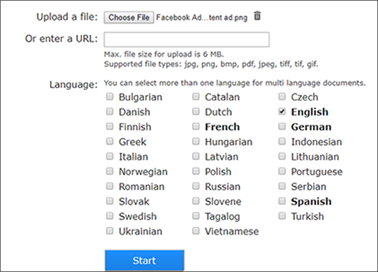 Select the page range and OCR language. Then click on the "Perform OCR" button to perform OCR on the scanned PDF. Next, click the "Edit" button on the top toolbar to enter PDF editing mode. Now double click on the texts in the PDF and edit as required. Alternatively, you can also click the "Add Text" button to insert texts anywhere you like. After you click the "Edit" button, you can control click (double click) on any image in the scanned PDF and then delete it, crop it or extract the image for other use. You even can click anywhere in the scanned PDF to insert an image. View a detailed guide on how to insert or add image to PDF on Mac or Windows PC. This smart PDF editing tool also allows you to edit scanned PDF pages. Once you import scanned PDFs into the program, go to the toolbar of the interface and select options to rotate pages, delete pages, or extract pages from scanned PDFs. 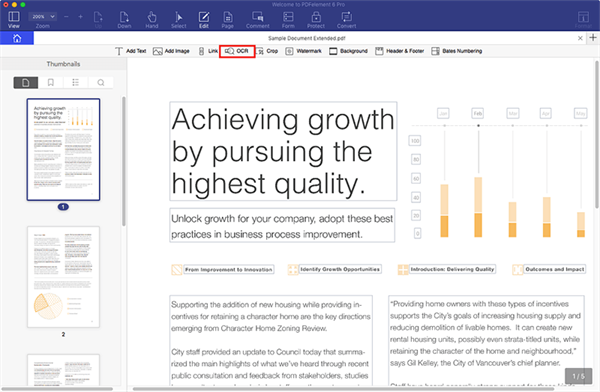 See the entire process on how to edit pages on PDF. To edit a scanned PDF in Mac OS X (10.14 Mojave included), you will need to use the OCR feature to edit, add text, and markup your scanned PDF file. 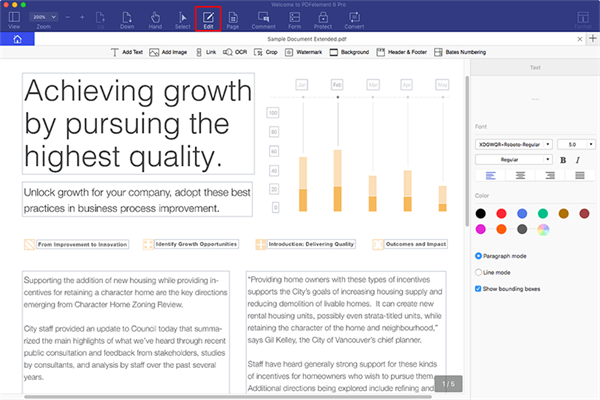 PDFelement ProPDFelement Pro, which is a powerful PDF Editor with OCR technology, lets you edit scanned PDF documents on Mac (Mojave). It also allows you to add tables, notes, text, and pictures to a scanned PDF document without hassle. This PDF Editor also has other powerful editing features that can fully meet your needs for PDF editing. Use it to convert PDF to Word and other popular file formats without losing original layout and quality. Edit scanned PDFs with a built-in OCR feature. Add, delete, and edit text and more in scanned PDFs. Convert scanned PDF to Word, Excel, PPT, Text, etc. 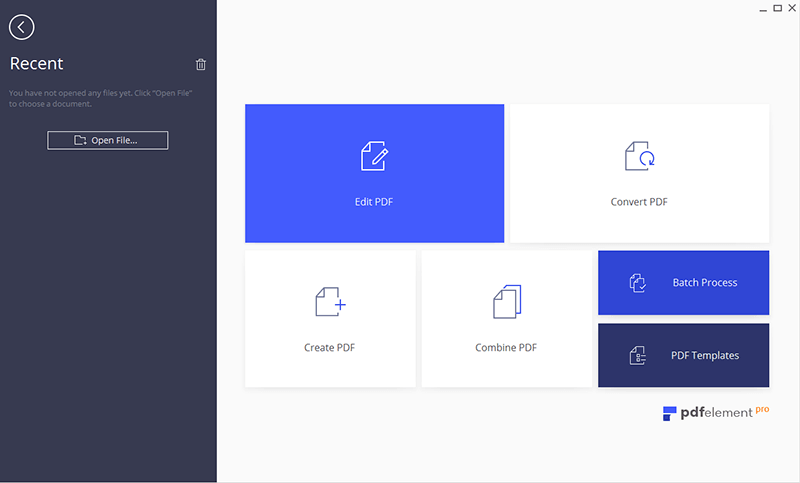 Create PDF from Web pages, images, and text files. Fill out PDF forms and create PDF forms from templates. Add personalized signatures and stamps to PDF. 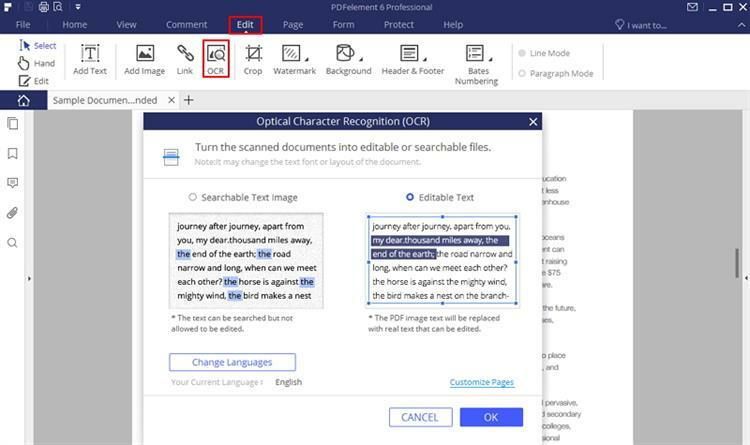 If you need to edit scanned PDF files on Windows PC (including Windows 10, 8, 7, XP and Vista), you can use PDFelement ProPDFelement Pro and enable the OCR plugin. With the help of this tool, you will not need to worry about editing scanned PDFs on your Windows computer, and you can use the editing tools of this program to add text or markup your PDF files. Follow the guide below to edit scanned PDFs on Windows. Install and run the program on your PC. In the main interface, you will see an "Open" icon. Click the icon to import the scanned PDF document you need to edit. Or you can directly drag and drop the PDF file into the program, and it will open automatically. To do this, you need to activate the OCR application by going to the "Edit" tab on the top toolbar and clicking on the "OCR" button. Then, you can start to edit scanned PDF files with various editing tools from this editor. Edit, markup, add images or even remove text from your PDF file. 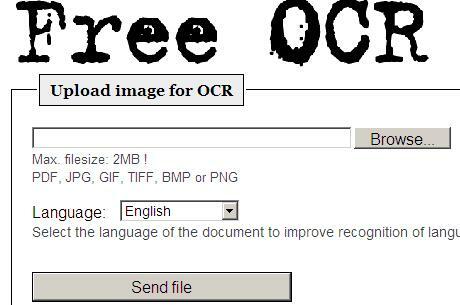 Another way to edit a scanned PDF document is to use a free online tool like Free Online OCR. This tool also has an OCR feature that you can use to convert a PDF image to text and then edit scanned PDFs for free. Like most online OCR tools, it is free to use and can be quite reliable, although it may limit the number of documents you can work on at once. This makes it ideal for a lower volume of documents. The following is a step-by-step guide to help you use the program to edit scanned PDF documents for free. Step 1. Go to the official website and click on "Choose File" to upload the scanned PDF into the program. Select the document's language and then click "Start". Step 2. Wait for the program to detect the text in the document. Once the process is complete, the text will be displayed on the next screen in TXT format. You can then edit the text in this window. You can download the text in TXT format when you're done. You can only extract the PDFs to TXT format. The extracted text will lose its formatting including text font and color. This free online tool may not be able to extract text from multiple documents at once. With the help of PDFelement Pro, you can make scanned PDFs editable. Convert scanned PDFs to Word , Excel, PPT, EPUB, HTML and Texts thanks to the advanced OCR function. The below steps will show you how to convert scanned PDF to Word format. After launching the program, you can directly drag and drop your scanned PDF document into the program dock. The document will automatically open in the PDF editor. In the top toolbar, click the "Convert" button. A pop-up window with output format options will appear. You can choose to convert the scanned PDF to Word format and edit it. After you confirm the output settings, click "Convert" to start the conversion. If you want to convert scanned PDFs to other formats like Excel, PPT, EPUB, HTML or text, check out this detailed guide on convert scanned PDF to text, etc. 1. What is a scanned PDF document? When we want to change a physical document into digital form, we use a scanner to scan the document rather than re-typing it manually. A scanner will take a snap-shot of the document then turn it into PDF using software integrated with the scanner. The computer will only recognize the scanned PDF as an image that contains words, but there is no information structure behind the document. So you are not able to text search the scanned PDF document without the use of OCR. Step 1. 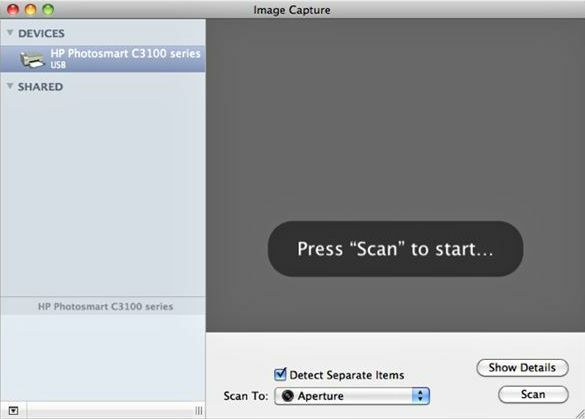 Launch Image Capture and check the option of “Detect Separate Items.” Then Image Capture will automatically scan your document into JPG format. Step 2. You can click the Show Details button to change the format to PDF. In the “Scan to” section, select a destination to save the output PDF file to. Step 3. Lastly, click the "Press" button and the document will be scanned to PDF in the Image Capture. There are many apps available in the Apple Store that allow you to scan to PDF without using a printer or scanner device. 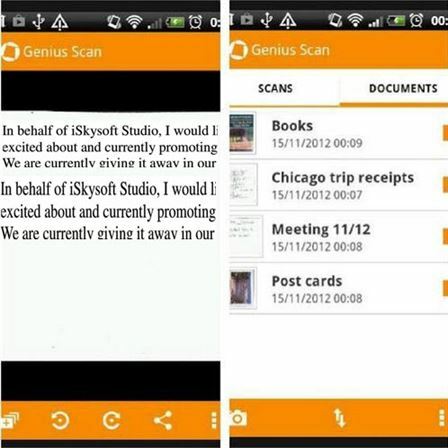 We recommend you use Genius Scan, which is an app that allows you to scan documents to PDF on the go. It also enables you to quickly export your documents as JPEG or PDF files. You even can email or organize the scanned documents. Step 1. Open Genius Scan on your iPhone and click the Camera icon to take a picture of your document. Step 2. Then press "Use" to enhance the picture. Or press the arrow to rotate the picture. Step 3. 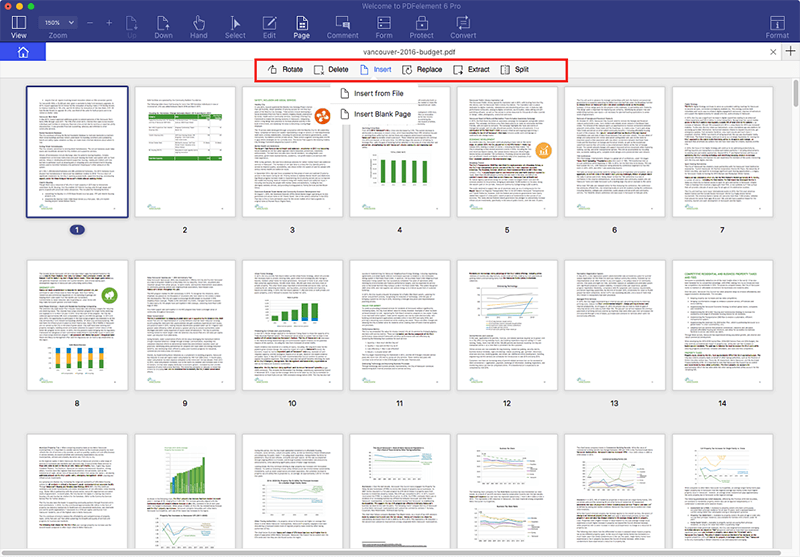 Now press the "Share" icon to save the document into PDF format. Lastly, press Save to confirm your changes.